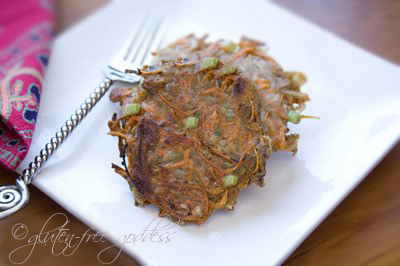 I love savory pancakes- shredded veggies add so much flavor. Savory or sweet? That is my question today- not to indulge in the duality of either/or and divide the pancake universe into opposing sensibilities or anything, but if push comes to shove (and I'm four square against shoving, honestly) the naked truth is I'm more of a savory, salty, golden crunchy pancake lover than a soft, sweet and sticky with maple syrup craver. Maybe it's because I love pancakes for supper. When I'm awake, in other words. And semi coherent. At breakfast I'm too groggy and non-verbal and sleepy-eyed to focus on measuring gluten-free flours and starches and pinches of xanthan gum. You cannot trust me with numbers and measurements. Not while there's a caffeinated beverage to brew (first priority). So that might be it. And if your next thought is, Dear Reader, Well, why for Pete's sake doesn't she just buy a gluten-free pancake mix? (and who is this Pete we always speak of, by the way? Does anyone know? Does he, for instance, have an opinion on pancakes?). Or you may wonder, why doesn't she make her own pancake mix ahead of time- she's a gluten-free goddess, after all? Excellent point. Maybe I will. Maybe I should. Maybe I oughta. Someday soon. Perhaps, even, mañana. But. Then I start imagining crispy brown edges of creamy potato and a sweet bite of carrot with the springy onion spike of green scallion. And I'm gone. Backtracking down the road heading home to savory. I can't help it. It's in my nature. Sweet or savory is the question. What are you? These tasty little beauties make a lovely vegetarian side dish or a perfect bite for brunch. Serve with yogurt, applesauce or hummus. More accompaniment suggestions and links below. In a bowl stir together the buckwheat flour, tapioca starch, baking powder, egg replacer, xanthan gum, sea salt, thyme, nutmeg, pepper, garlic. Add in 1/4 cup hemp milk and stir to combine. If the batter is very thick, add a small amount of hemp milk to thin- you want enough moisture to make the batter coat the shredded vegetables. Stir in the grated veggies and mix well. Heat a coating of light olive oil in a frying pan till hot. Drop forkfuls of the vegetable batter into the hot pan, press and shape into a pancake. Cook on both sides until golden brown. Drain on a paper towel. Keep warm in the oven till serving, if you need to. Serve with a dollop of horseradish sour cream or yogurt with mint. mmmmmm....this looks AMAZING,I am definitely savory!so excited about veggie pancakes! Yummy - I like them both ways! You simply can't go wrong with pancakes! I also like them both ways! Although I guess I prefer sweet. I've been known to have pancakes with real maple syrup for dinner! YUMMY!! These look and sound great, K! I'm wondering how you think they might keep since I am usually cooking for just me. Will they keep in the fridge for awhile and could be warmed in a pan for the next round eaten or would they freeze ok? I forgot to also ask what to do if I don't have egg replacer. I usually would just use an egg but since this only calls for a teaspoon of replacer one egg might be too much huh? I've definitely been a sweet gal my whole life. . . until I tried potato pancakes a few weeks ago and fell in love. These look just terrific! oh, these look fantastic. can they be made ahead and frozen? Oh, yes, I am definitely savory. I can't WAIT to make these! I really like the addition of the carrots and cabbage. And the mixing of one sweet potato and one gold potato. So really I just like the whole idea. :) Lovely work Karina. Evidently is goes back to biblical origins. Great site for those phrases that pop into our minds and we ask, where did that start. I'm definitely savory. I even eat my breakfast pancakes not with maple syrup, but with butter and a pinch of salt. I don't have to tell you how much mocking I have received b/c of it! Your pancakes look amazing - similar to the kind my mom made when I was little. I will probably eat the entire batch myself! Karina! You're recipes are such a god-send for me!!! I'm vegan and am trying to stay away from gluten as much as I can. So far I have made your Roasted Tomato soup (back when the tomatoes were coming right from my back yard), your delectable sweet potato latkes, and then your scrumptions vegan cappucino brownies. One word sums up the gist of all of them: AMAZING, truly. Thank you, and I am so looking forward to trying more recipes. 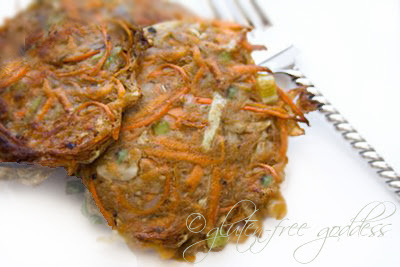 I'm going to try these veggie pancakes tonight. You are such an inspiration, thank you!!! Rach- Another bi-pancake girl. Rock on. Angela- Can you ever have too many potato pancakes? Jill- I wrapped and froze some as an experiment. I thawed and warmed them up in a pan; but next time I would try using a baking sheet and heating them in the oven or toaster oven. As for the egg question- maybe just use one egg white. That should work. VeggieVixen- Yes. I need to eat more pancakes, I've decided. VeggieGirl- I think these pancakes might be right up your alley, Chica. Kalinda- Thanks so much- appreciated. Anon- Why, thank you. I'm so happy you like the soup and the vegan brownies. Yay. These look super...and great photo! I like both sweet and savory pancakes, I just cook what I am in the mood for in the moment. Sometimes buckwheat pancakes, sometimes teff banana pancakes, and sometimes the root vegetable pancakes from our Cookbook. When I make these I use mostly vegetables, no egg, and only a little rice flour. I like to serve them with cultured vegetables on the side. Yummy Karina! I replaced the potato with cauli and zucchini that I squeezed to get the moisture out of (can't do starches) and these were a hit. Great flavor, beautiful to present. Glad to find a new healthful breakfast food. Thanks! Ali- Yum- you're making me hungry. 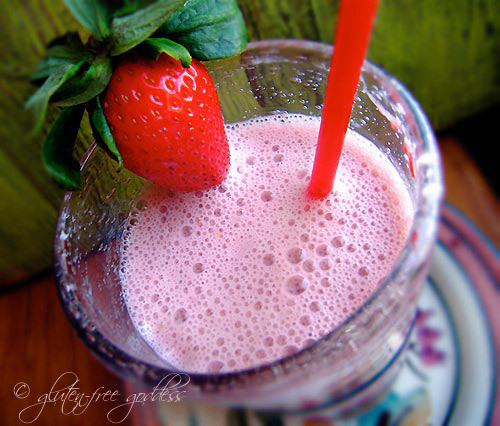 Lauren- That's a fab idea- and great for folks on South Beach and lower carb diets. Thanks for sharing your tweaks with us. I'm making these tomorrow night but I couldn't find any tapioca or potato starch... could corn starch substitute fine? I remember the day that I stopped eating pancakes with syrup. I said to myself--I don't like them. This is the same day I gave up on bananas. A couple of years ago a friend started making me really wonderful potato/zuchini pancakes with a creamy cashew dill sauce. Unbelievable and gluten free, though I hardly even thought about it. So there you go. Wonderful looking recipe. Thanks. It really depends on the time of day for me whether I want sweet or savory. I love some good potato pancakes for dinner. These look good. thanks! 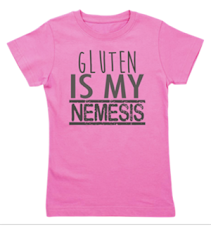 I'm newly exploring the world of gluten-free, thanks to a friend. Recently, my daughters and I made our first gluten-free dessert to take to this friend's house in honor of her husband's aversion. She told us not to worry about it, but we thought it would be fun to go the extra mile for these precious friends who are so kind to us. I love your blog and hope to make your savory crackers soon. They look delectable! I teeter between savory and sweet, but your pancake idea is a good one. I may try them. I have a wonderful savory waffle recipe that is not gluten-free, but it's great with eggs benedict and pesto. I agree that we should tend to first things first in the morning, which certainly means coffee! Help Karina! I tried to make these veggie pancakes tonight, and while they tasted WONDERFUL, they completely fell apart. First I made the recipe as-is, and it looked to have way too many veggies compared to batter. They wouldn't stick together at all. So I made a second batch of the batter and mixed that it, and they still wouldn't stick together at all. What am I doing wrong? Would you be able to give approximate quantities for the veggies (i.e. 2 c. grated carrots)? How batter-y is the final mix supposed to be, and how big are the final pancakes supposed to be? Thanks so much because my family really liked these, even if they did fall apart. Pwarias- I'm not sure- I might use rice flour instead- I'd be afraid the cornstarch might turn gummy. Dawn- You don't need a lot of batter- just enough to help bind the shredded veggies. The amounts I used are in the recipe. Was your oil hot enough? Did you press down a bit with a spatula as they cooked? When I made them, they didn't stay together, either. I followed the directions, but thought maybe my veggies were different sizes than yours. I tend to have problems keeping veggie/bean patties together, other than falafel, though. Oh! I forgot to say, they still tasted yummy, it was just more of a stirfried scramble than patties ;). Another option- try adding a touch of xanthan gum. Thanks for your response. I think my veggies were much bigger than yours or something. Even after doubling the batter, the veggies were still just lightly coated--there was no batter dripping off the veggies. I did add a little more rice milk (didn't have hemp) to the batter, since it was originally very thick, like a paste--perhaps I added too much. The oil was quite hot and I pressed the patties together plenty, but I think the moisture from the cooking veggies was too much for the small amount of binder--it's very humid here in Houston. Perhaps I'll try to add a tiny bit of xanthan gum next time, since I can't do real eggs. This is definitely a "do again" recipe for our family, so I'll have time to play with it. By the way, we served ours with apple sauce and plain yogurt for the dairy-eaters. Yum! Dawn, that's exactly what happened with my veggies. Adding extra liquid did not help them stay together. I need to try again, using an egg or some xanthan gum. If you try, will you post a comment again so the rest of us know if the xanthan gum works? First off, thank you for sharing your amazing recipes. I am going to try this one for the first time this weekend. I can't seem to locate buckwheat flour anywhere. What alternate GF flour do you recommend? I've only made these with buckwheat flour. I imagine any good tasting gluten-free flour or baking mix blend would work (I'd stay away from the pure starches). Wow! This recipe was my first taste both preparing and eating a savory vegetable pancake. Thanks so much for sharing, it was utterly scrumptious. I just had to write and say I love, love, love your site and your recipes. My son's allergies have us cooking vegan and gluten-free. 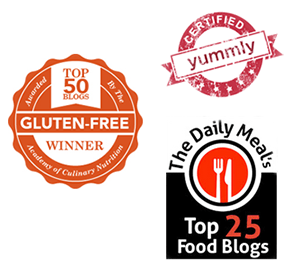 It can be really tough, but your recipes are dependably delicious -- even our non-allergic teens eat them happily! Thank you sooo very much!